on behalf of the Clare branch of BirdWatch Ireland. The following report is based mainly on submissions to the scarce and rare birds section of the www.clarebirdwatching.com website during 2007. A total of 1,313 individual records were submitted to the website during the year covering 288 days, up marginally on 285 days coverage in 2006 and well ahead of the 184 days coverage in 2005. Other records came from Birdtrack. The year will be remembered as being particularly wet, with rain almost daily from New Years Day until about 18th March, and then after a six week dry spell rainfall again almost daily from May until early September; a second dry spell lasted until around late November when the rain returned. In terms of temperature, the winter months were very mild. Four species were added to the county list in 2007: a Bufflehead, Ireland’s second record and for many the “Bird of the Year” was found at Lough Atedaun, Corofin when the year was not yet a week old; October provided two more additions with a Buff-bellied Pipit (fourth Irish record) at Clahane and Arctic Redpolls at Kilcredaun (fifth Irish record). The final addition was a Cattle Egret found at Clahane, part of a major influx of the species into Ireland and widely speculated as pioneering colonists. With these additions, and the inclusion of Alpine Swift which had been previously overlooked, the county list currently stands at 309 Species. Seawatching provided many highlights at the Bridges of Ross during the Autumn and included reports of three Fea’s Petrels, four Wilson’s Petrels and over 70 Balaeric Shearwaters, but numbers of Cory’s and Great Shearwaters were lower than usual. Elsewhere, rare ducks were in evidence with two Green-winged Teals at Bell Harbour and Lough Atadaun, Garganey at Shannon Airport Lagoon, and there was an influx of Ring-necked Ducks mainly in EnnisCorofin area. A Goshawk was reported following a brief sighting, two Marsh Harriers wintered in the county during the year while two Common Buzzards were also reported but as in 2006, the pick of the raptors were the Ospreys which visited and lingered around the county during the summer months. Doonbeg has become a magnet to transatlantic vagrant waders in recent years, and this year a Buff-breasted Sandpiper and the third Spotted Sandpiper in three years (and the third county record) continued the trend, while the Long-billed Dowitcher returned to Shannon Airport Lagoon. There were no less than two Bonaparte’s Gulls during the year (the third and fourth county records), two Water Pipits (third and fourth county records) and a Rose-coloured Starling (seventh county record). Although Loop Head was relatively quiet when compared to last year’s excitement, nearby Kilcreadaun still produced a Common Rosefinch (sixth county record). The Common Rosefinch and the Arctic Redpolls highlighted Kilcredaun lighthouse as an area that deserves increased scrutiny in the future. In the 2006 report, local birders were asked to submit any sightings of Tree Sparrows in the county as it was unclear if the species was being overlooked, in serious decline or even extinct in its former haunts. Hopefully a fuller picture of Tree Sparrow’s status in the county is apparent in this year’s report. In the year ahead, observers are asked to continue to note sightings of Tree Sparrows and Yellowhammers as they have done in previously but also to take particular note of Redpoll numbers, as they have been overlooked in recent years. The sequence followed is that of Professor K.H. Voous’ List of recent Holarctic Bird Species (1977). Some records within this report may not yet have been accepted by the Irish Rare Birds Committee (I.R.B.C). For rare species with bracketed numbers e.g. Bufflehead (0,1), the first number stands for record of occurrences with county Clare to date and the second one for the number of occurrences within the year covered by this publication. Regular winter visitor and passage migrant. two, 15th July; 11, 19th July; two, 25th August; 30, 9th October; 19, 23rd November. On passage: six, Bridges of Ross, 15th September. Ballyvaughan: 50, the Rine, 2nd February; 20, 4th February; two, 18th February; 42, 3rd March..
Ballyvaughan to Bishops Quarter: four, 21st January. Black Head: 16, 25th November. Liscannor: one, 18th April; six, 26th November; one, 16th December. North Clare: 19, 30th December. Common winter visitor and passage migrant. Black Head: one albino bird, returning individual, 20th February. 14, 25th November. Ballyvaughan to Bishop’s Quarter: 15, 21st January; 22, 10th April. Kilkee summer: one, 11th to 20th June. Lough Murree: 20, 29th November. North Clare to Flaggy Shore: 21, 12th April. Quilty: two, Lurga Point, 20th June; possible same individuals off Seafield, 19th July. Corofin high count: 80, Lough Inichiquin, 20th September. Doorus: one in winter plumage off the pier, 3rd March. Bridges of Ross: one, 15th August; two, 18th August. Bridges of Ross: one, 23rd August; one, 24th August; one 25th August; eight, 2nd September; one, 3rd September; two, 24th September. The following unconfirmed reports refer to four birds on typical dates from the Bridges of Ross: one, 21st August (Richard Taylor); two, 25th August (Andy Clifton); one, 26th August (Allan Conlin). Since the first county record at the Bridges of Ross in 1995 the majority of the fifteen subsequent recordsreports (including 2006) occurred in August. Any observers planning to visit the Bridges of Ross to see Fea’s Petrel will find it useful to know that of these sixteen records, two have occurred on 21st of the month four on the 25th and two on the 26th August. Black Head: 300, 28th May. Bridges of Ross: 200, 16th May; 60,000, 9th July; 5,000, 2nd September. Liscannor: 200 were seen off the pier on 20th June; 100, 4th July. Bridges of Ross: three, 12th August; two, 15th August; five, 18th August; three, 19th August; two, 20th August; eigth, 23rd August; seven, 24th August; 28, 25th August; five, 26th August; four, 27th August; two, 28th August; two, 24th September. This species has been recorded almost annually since the first in 1983. Bridges of Ross: one, 4th July; two, 9th July; 58, 4th August; ten, 5th August; six, 15th August; four, 16th August; eight, 18th August; 18, 19th August; eight, 20th August; 20, 23rd August; 185, 24th August; 600, 25th August; 20, 26th August; one, 27th August; one, 28th August; six, 31st August; 45, 1st September; 145, 2nd September; 12, 3rd September; 180, 16th September; 600, 24th September. Bridges of Ross: 120, 4th July; 60, 6th July; 30, 9th July; 25, 4th August; six, 5th August; two, 18th August; eight, 24th August; two, 30th August; three, 31st August; eight, 1st September; 21, 2nd September; three, 15th September; 22, 16th September; 20, 24th September. Hags Head: 100, 20th June; 10, 28th June; four, 19th July. Liscannor: one off the pier, 20th June; ten, 4th July; 25, 6th July; 25, 26th July. Miltown Malbay: 20 were at Green Island on 20th June; 20, 21st June; eight, 29th June; seven, 4th July; three, 5th July; five, 25th July; seven, 28th July; five, 5th August. Quilty: 20 at Seafield, 20th June; three, 29th June; two, 3rd July; 20, 4th July; ten, 6th July; one, 12th July; eight, 28th July. Bridges of Ross, four: two, 4th July (K. Mullarney); one, 9th July (D. Breen); one, 5th August (D. Breen). There have been nineteen reports of Wilson’s Storm Petrel off the Clare coast since 2001, all during the months of July (4), August (13), and September (2). This species is now annual at the Bridges of Ross. Bridges of Ross: three, 1st September; eight, 2nd September; two, 15th September; two, 16th September; 15, 24th September. Ballyvaughan: five, Bishop’s Quarter, 21st January. Ballynacally: one, Ballycorick Bridge, 6th November. Ballyvaughan: one, The Rine, 2nd to 18th February; one, 30th December. Carrigaholt: one, 4th to 30th October. Doonbeg: one, 5th August; one, 31st August; one, 25th November. Ennis: one, Doora Bridge, 5th May. Kildysart: one, 28th January; two, 13th August. Lahinch Marsh: one, 5th to 21st January; two, 20th to 24th February; one, 23rd November. Liscannor: two, 6th to 7th January; one, 22nd January; one, 8th March; one, Kilmacreehy Church, 3rd to 8th December. Poulnasherry: one, Moyasta, 13th to 19th January; two, 23rd March; ten, 25th August; nine, 9th September; nine, 4th October; seven, 31st October; seven, 27th December; one, Blackweir Bridge, 18th January; two, 19th January; one, 23rd January; one, “Poulnasherry Bay”, 24th March; ten, 29th August; seven, 30th August; 13, 17th October equalled the county record. Quilty: one, Lough Donnell, 2nd August. Shannon: one, Tullyvarraga Marsh, 1st January; one, Inishcullen Hill, 10th February; one, 8th June; one, Airport Lagoon, 14th April; two, 4th August; one, 11th August to 1st September; three, 9th September; five, 15th September; five, 4th October; three, 17th November; one, Ballycasey, 26th December. Recorded in every month except July, the county record was equalled during the year. Although the Little Egrets can now be seen just about anywhere on the coast, they are still rare inland at lakes or on the upper reaches of rivers. Liscannor: one in a field with cattle, Clahane, 15th to 17th December (J. N. Murphy et al). This is the first county record and was part of an influx of several Cattle Egrets recorded in the Britain and Ireland in late 2007. This bird was last seen flying towards the sea on the evening of 17th December and was not seen again (T. Lynch, N. Lynch). Clarecastle: 14, Islandavanna, 25th February. Clenagh: 22 in the bay, 27th January. Corofin: 19, Lough Atadaun, 1st to 7th February; three, 11th August; 77, Lough Inchiquin, 19th November. Ennis: 26, Ballyallia, 6th January; 26, 15th November. 17, 2nd November; 15, 17th November; 30, 23rd November; 47, 30th December. Ennistymon: 14, Lough Cullanagh, 7th March. Flaggy Shore: 34, Lough Murree, 29th November. Kilfenora: 73 near the village, 12th December. Kilkee: 20, Tullagher Bog, 18th February; 16, 30th December. Newmarket-on-Fergus: 10, Ballycar Lake, 14th January; 16, 19th January; 14, 29th January; 12, 30th January; 12, 14th February; 14, 18th to 25th February; 16, 28th February; 16, 7th to 8th March. 99, Balligirreen, 27th January; 74, 20th February; 60, 25th February; 46, 27th February; 72, 1st to 3rd March; 62, 9th March; 16, 6th November; 55, 19th December; 60, 21st December. Quilty: 26, Lough Donnell, 27th December. Shannon: 87, Airport Lagoon, 17th November. Winter visitor in small numbers. Tubber: 22, Lough Muckanagh, 21st February; 23, 7th February. These two traditional haunts are well separated, with Tullager Bog located in the south-west of the county and Lough Muckanagh situated in the north-east. They can be viewed on a distribution map here. Lahinch Marsh: six, 4th to 21st January. As these records demonstrate, previous observations of Pink-footed Goose have been well scattered across the county. Newmarket-on-Fergus: five, Ballycar Lake, 1st January; two, 2nd January; 16, 15th January; two, 22nd January; two, 2nd May; one 7th October; one, 28th December. Seven, Fenloe Lake, 7th January; four, 24th February; four, 18th December. Winter visitor and passage migrant. Doonbeg: 90, 13th January; 43, the Long Field, 23rd December. Kilkee: 120, Mutton Island, 1st March. 83, Illaunanearean, 27th December. Lahinch Marsh: one, 20th October. Quilty: six, Lough Donnell, 28th March; 186, 31st March; 110, Mutton Island, 18th November. Ballyvaughan: 90, Lough Murree, 6th February; 146, Bishop’s Quarter, 3rd April; 223, The Rine, 30th December; 3rd April. Flaggy Shore: 79, Lough Murree, 29th November. Lahinch: 31, Creg Beach, 30th January; 45, Lahinch Marsh, 24th February. Liscannor: 60, Goleen, 14th March; 70, 19th March. Poulnasherry Bay: 192, 24th March. Resident and common winter visitor. Shannon: 82, Airport Lagoon, 14th April. Scarce winter visitor and rare breeder. Numbers in Clare seem to be decreasing rapidly. Corofin: 13, Lough Inchiquin, 1st February; 18, 19th November. Shannon: five males, Airport Lagoon, 9th June. Common winter visitor, scarce breeder. Bell Harbour: the male which first wintered at this site in 2004/2005 (and may also be the bird which was observed at the site in 2002), was seen on 7th January, and had returned for its fourth winter on 30th December. Corofin: male, Lough Atadaun, 27th January to 25th February. Shannon: one, Airport Lagoon, 14th May; female/immature, 18th to 23rd August. During this decade Garganey has been recorded in every year except 2004. Carrigaholt: 23, on 27th December. Flaggy Shore: 15, Lough Murree, 29th November; three, 30th December. Shannon: female, Airport Lagoon, 25th February. Common resident and winter visitor. Corofin: one female, Lough Inchiquin, 6th January (J. N. Murphy, F. Mac Gabhann) ; first winter male, 16th January (M. Meehan, I. Zawadzka) ; female, 23rd January to 25th February (T. Griffin, J. Rattigan); male, 9th November to 30th December (F. Mac Gabhann). Ennis: first winter male, Ballyallia Lake, 3rd January (D. Mc Namara); first winter male, adult male and female, 4th to 6th January (J. N. Murphy, F. Mac Gabhann); male, 17th January (J. N. Murphy, J. Lyons) first winter male, adult male and female 1st February (F. Mac Gabhann); male, 9th to 15th February (F. Mac Gabhann, S. Nugent); male and female, 22nd February to 22nd March (T. Lynch, F. Mac Gabhann, S. Mc Enry, J. N. Murphy ); nearby on the floodplain at Rosslevan, male, 7th and 8th March; female, 13th March (J. N. Murphy, S. Nugent). Kilrush: male and female, Tullabrack Lake, 24th April (T. Gittings). It was an excellent year for this species in Clare with about five individuals involved in this influx, and may have involved some returning birds from the previous year. The Ennis and Corofin birds alternated between Ballyallia and Lough Inchiquin which are just a few miles apart and were also obversed at Rosslevan. Liscannor: first winter male off the pier, 15th to 17th December. The most recent records for Eider in Clare came from Kilkee in 2001 and 2004 and Ballyvaughan in 2005. Ballyvaughan: 65, The Rine, 2nd February. Bridges of Ross: six, 19th August; three, 25th August; four, 28th August; four, 29th August; four, 30th August; four, 31st August; 15, 1st September; eight, 2nd September; three, 29th September. Doorus: one off the pier, 3rd March. This was a poor year for the species. Ballyvaughan: 16, The Rine, 2nd February. Burren: one, Lough Cullaun, 21st February to 7th March is an inland record. Liscannor: peak of two, 19th January to 20th April. North Clare remains the stronghold for this scarce winter visitor. Liscannor: two males, 21st June. Corofin: female, Lough Atadaun, 6th January to 4th March (J. N. Murphy, F. Mac Gabhann et al). This is the first for the county and the second Irish record. Its lengthy stay provided ample opportunity for many to catch up with this mega-rarity . The first record was in County Cork in 1998. Ennis: female, Ballyallia Lake, 3rd January; male, 1st February; probably same male, Lee’s Road Wood, 8th February. It appears that two birds wintered in the county. Scarce resident and passage migrant. Bridges of Ross: one, 27th August. Doolin: two males, Doonagore bog, 25th February; one, 1st male; female, 27th May; female, 19th October; female, 17th November; two females, 19th November. Doonbeg: one, Killard, 25th September. Kilkee: male near the town, 13th July; female, 11th November. Lahinch: one, Bartra, 18th to 21st September; female, Inagh estuary, 4th May. Lissycasey: male, Booleynagleeragh Bog, 9th June and 28th June; female, Booleynagleeragh Bog, 14th July. Loop Head: juvenile, 31st August; female, 29th September; female, 4th October; female, 14th October. Quilty: female, Lough Donnell, 29th June; juvenile, 6th August; male, 16th September; male, 7th October. Tubber: female, Lough Mucanagh, 7th March; male and female, 29th December. Clare is an important for breeding Hen Harriers and a controversial plan with government backing is afoot to protect Hen Harrier breeding sites in the Sliabh Aughty mountains of east Clare. Ballyvaughan: one, Muckinish East, 30th September. Loop Head: one, 29th September. It seems likely that this series of records refer to two individuals. One was seen at Darragh on 22nd February (B.O’Donoghue) and is the second county record. Burren: one, Slieve Elva, 1st May. Lahinch: one, Inagh estuary, 26th May to 6th July. Lissycasey: one, Lough Acrow, 28th June. It is unclear as to how many individuals these records refer. the involvement of two individuals as a distinct possibility. Loop Head: six, 29th September; seven, 4th October. Bridges of Ross: one, 3rd September. Doolin: one, Doonagore bog, 25th February; one, 19th October. Doonbeg: one, White Strand, 23rd April. Ennis: one, Rosslevan, 7th March. Lahinch: one, Inagh estuary, 9th October; male, 17th November. Liscannor: two, 26th March; two, Clahane, 3rd November; female, 17th November. Loop Head: one, 23rd September; three, 4th October; three, 14th October; one, Kilcredaun Marsh, 27th October; two, Kilcreadaun, 30th October with one remaining to 31st October. Quilty: two, Lough Donnell, 29th March; one, 23rd July; one, 13th October; female, 29th December. Bridges of Ross: two, 15th September. Burren: three, Ballybruck North, 28th July. Corofin: one, Lough Inchiquin, 19th November. Doolin: one, 1st March; one, 29th March. Flaggy Shore: two, Lough Murree, 29th November. Lahinch: one, Inagh estuary, 3rd April; one, 25th May; one, 28th July; one, 9th October; two, near Lahinch, 8th June; two, Bartra, 15th to 26th July; one, 3rd September. Liscannor: one, 25th February; one, 4th September; one, 7th October. Loop Head: one, Cloughaun Lough, 10th October; one, 14th October; one, 3rd November. Miltown Malbay: one, Green Island, 5th August; two, 2nd October. Newmarket: one, Ing, 7th July; one, Ballycar, 29th April; one, 18th September. Quilty: one, Lough Donnell, 22nd May; one, Seafield, 15th August. This species was under recorded in previous years. Miltown Malbay: two, Mount Callan, 27th March and 6th April. Burren: one, Lough Bunny, 29th May. Ennis: one, Oak Park housing estate, 24th July, was an unexpected find. Loop Head: one, Kilcredaun Marsh, 25th and 27th August. 20th and 25th April; one at Ballycar NS, 4th October. Shannon: a peak of two heard regularly during the year. Tubber: one, Lough Muckanagh, 29th December. Shannon: one, Airport Lagoon, 29th June. Clarecastle: 1,200, Islandavanna, 25th February. Lissycasey: 150, Booleynagleeragh Bog, 10th March. Newmarket-on-Fergus: 350, Ballycar, 10th March. Shannon: 450, Airport Lagoon, 15th September. Ballyvaughan: 20, The Rine, 2nd February. Common winter visitor and breeder. Shannon: two, Airport Lagoon, 9th June. Shannon: 15, Airport Lagoon, 14th July; 50, 15th September. Quilty: one, Seafield, 17th August; two, 2nd October; one, 9th to 18th October. and is well down on the six birds seen in the county in 2006. This transatlantic species is almost annual. Quilty: one, Seafield, 9th October; two, 10th to 13th October. Shannon: one, 4th August; one, 7th to 9th September. Liscannor: eight, Clahane, 25th November. Quilty: 100, Seafield, 13th January; 110, 25th February; 40, 16th May; 70, 3rd December. Seafield and Lurga Point at Quilty remains the stronghold of this winter visitor in Clare. Summer: twelve, Shannon Airport Lagoon, 9th June; 50, had returned from their breeding grounds, 14th July. One at Doonbeg , 1st to 3rd September was the first for a number of years (D. Mc Namara, L. Benson et al). This was the first occurrence of this species in Clare for a number of years, and the total number of records is now in the teens. Quilty: three, Lough Donnell, 12th August; one, 22nd September. Shannon: one, Airport Lagoon, 9th to 15th September. Doolin: two at Doonagore Bog, 25th February. Loop Head: two, 3rd January. Shannon: two in the town, 26th February. Adult in summer plumage at Doonbeg, 4th and 5th August (D. Mc Namara, D. Breen, L. Benson). Unrecorded in Clare before 2005, this is the third year this North American species has been reported but the first time it has occurred in summer plumage. The previous records come from Doonbeg (2005) and Kilbaha (2006). Summer plumaged Spotted Sandpiper at Doonbeg John N Murphy. a returning individual (F. Mc Gabhann, John N Murphy et al) and is the tenth county record. Scarce under-recorded resident and winter visitor. Dysart: a peak count of four at Gortcoirce, between 3rd and 14th November; three, 12th December. Shannon: 500, Airport Lagoon, 14th April; one, 9th June; 250, 14th July; 1700, 15th September. Quilty: 19, Lough Donnell, 15th July. Regular winter visitor, mainly to coastal regions but can be seen in Shannon and Fergus Estuaries. Clarecastle: one, Islandavanna, 1st May; two, 13th May. Ennis: seven, Ballyallia, 2nd May; 16, Knockanean, 2nd May. Kilkishen: fourteen, Ballyblood Bog, 3rd May. Liscannor: three, 17th April, decreasing to one, 18th April; 40, 23rd April; 20, Clahane, with 150 near the pier at Liscannor, 28th April. Quilty: 100, Lough Donnell, 28th April; two, Seafield, 18th and 19th April; 20, 23rd April; 82, 24th April; 35, 28th April. There was a total of 500, between Quilty and Lough Donnell on 4th May. Twenty, Quilty, 11th June. Bridges of Ross: 42, 4th August; 25, 25th August; ten, 28th August; 17, 2nd September. Doonbeg: three, 19th July; 100, 4th August; 50, 5th August. Liscannor: one, Clahane, 25th October. There was an albino bird at Lough Bunny on 6th February. Lahinch Marsh: 170, 21st June; 200, 15th July. Miltown Malbay: 70, Green Island, 25th July. number of years had returned by 9th September. Poulnasherry Bay: one, 5th August. Shannon: one, Airport Lagoon, 3rd to 29th August; two, 1st September; one, 7th September; two, 9th September. Shannon: 187, Airport Lagoon, 14th April; one, 9th June. Poulnasherry Bay: 15, on 30th August. Scarce passage migrant, occasionally winters. Ballynacally: one, Ballycorick Bridge, 1st February; two, 22nd February; three, 9th September; one, 17th September to 6th November. Clarecastle: two, Manusmore, 22nd October. Doonbeg: juvenile, 29th June to 19th July; one, 8th to 18th August. Ennis: one, River Fergus, 3rd February. Ennistymon: one, The Falls, 2nd April. Poulnasherry Bay: one, Moyasta, 29th August; one, 9th September; two, 22nd September; one, 25th September to 6th October; two, 17th October. Quin: one, Rine River, 6th September. Shannon: one just over the dyke from the Airport Lagoon on the estuary mudflats, 13th August. Shannon: one, Airport Lagoon, 7th September. Scarce breeder and regular passage migrant. Bunratty: one on the Owengarney River, 10th November. Clarecastle: one, The Quay, 7th January. Burren: two, Lough Bunny, 26th April; two with four chicks, 29th May; two, Mullaghmore, 20th May. Crusheen: one, O’Brien’s Lough, 26th April. Doonbeg: peak of five between 3rd July and 4th August; one, 8th and 9th August; three others at the mouth of the Skivileen River beside Doonbeg Golf Club, 9th August; one, 18th August; one, 3rd September. Ennis: one, River Fergus, 16th July. Lahinch: one, Inagh estuary, 3rd July; four, 9th August; three, 25th to 26th August. Lissycasey: two, Lough Acrow, 28th June. Loop Head: one, Cloughaun Lough, 12th August. Newmarket-on-Fergus: two on the Rine River, Latoon, 22nd October. Poulnasherry Bay: four, 6th August. Quilty: two, Lough Donnell, 23rd July. Shannon: one, Airport Lagoon, 15th September. Bridges of Ross: two, Bridges of Ross, 19th August; 80, 24th September. Ballyvaughan: one, Bishop’s Quarter, 21st January. Liscannor: four, 6th January; two, 8th January; one, 9th to 13th January; two, 16th January; one, 17th and 18th January; three, 19th January. Westerly storms in December 2006 were responsible for the occurrence of this attractive wader in January. Lahinch: two were observed and photographed feeding on a carcass at Cregg Beach, 23rd to 26th May. Loop Head: one, Kilbaha, 31st August; one, Renville Bay, 4th October; eight, The Fodry, 26th October. Lahinch: two were observed feeding on a carcass at Cregg Beach, 23rd May. Liscannor: one, 24th May; one, 27th May; one, 4th July; one, 26th July; one, 4th September; one, 18th September; one, 20th to 21st September. Loop Head: five, Kilbaha, 31st August; three, The Fodry, 26th October; one, off the tip, 29th October. Quilty: one, Seafield, 25th May; one, 19th July. Bridges of Ross: four, 24th September (observers unknown). Loop Head: immature, Renville Bay, 4th October (John N Murphy); immature, The Fodry, 26th October (John N Murphy & Finbarr MacGabhann). Bridges of Ross: ten, 4th August; five, 5th August; two, 12th August; one, 15th August; two, 16th August; three, 18th August; five, 29th August; ten, 20th August; three, 24th August; one, 30th August; five, 31st August; one, 1st September; six, 2nd September; two, 15th September; 22, 16th September; 14, 24th September. Loop Head: two, The Fodry, 26th October; one of the tip and another Kilbaha, 31st October. Miltown Malbay: one, Green Island, 5th August. Knock: three adults, one juvenile, 27th August. Lahinch: second winter, 2nd to 5th January; first winter, 3rd January; adult, 17th January; first winter, 16th April; first winter, 4th September; one, 13th October; adult, Clahane, 25th November to 27th December; second winter, 8th December. Loop Head: two immatures, 29th September. New Quay: adult, 3rd March. Querrin: five first winters, 31st August. Quilty: one, 28th January; one, 3rd April; first winter wearing a green band on left leg, 16th April; two, 17th August; one, 18th August; second winter, Lough Donnell, 10th to 15th August. Recorded during seven months of the year, it was a good year of this species. Scarce winter visitor and passage migrant. Bridges of Ross: second winter, 1st January; two juveniles, 31st August; one, 24th September. Liscannor: six adults, 1st and 2nd January; 12, 3rd January; 12 adults, first winter, two second winters, 4th and 5th January; ten, 6th January; nine, 7th January; four, 11th January; three, 13th January; second winter, 17th to 21st January; one, 13th October. Loop Head: two, Kilbaha, 1st January; juvenile, 13th January. Records for this species befitted from the adverse weather conditions during the early part of the year. Loop Head: one adult was filmed 6km west of Loop Head; one off the tip, 29th October. Miltown Malbay: juvenile, Green Island, 18th September. A good year for this species. Liscannor: first winter, 7th December (D. Mc Namara). Shannon: adult, Airport Lagoon, 10th to 22nd August (D. Mc Namara, J. N. Murphy, F. Mac Gabhann et al). One local observer was responsible for doubling the county records for this species in 2007. Bonaparte’s Gull at The Shannon Airport Lagoon John N Murphy. Lahinch: one, which was seen on in the Inagh estuary on the 28th April carried a yellow leg ring 283A. Shannon: 1,500, Airport Lagoon, 10th August. Kilkee: first winter, 27th December. Kilrush: first winter at the Marina, 28th October. Quilty: adult, Seafield, 2nd March to 19th April; second winter, 13th October; adult, Lough Donnell, 22nd May; adult, 10th August. Ballyvaughan: first winter, The Rine, 2nd to 6th February. Lahinch: first and second winter, Inagh estuary, 2nd January; five, 21st January; two adults and two first winters, 22nd January; two first winter, 10th February; one second winter, 8th March; adult and two first winters, Cregg Beach, 30th January. Liscannor: first winter, 3rd January; first and second winter, 4th January; first winter, 5th January; first and second winter, 6th January; adult, 17th and 18th January; first winter, 21st January; two first winter, 20th February; first winter, 7th March; adult and first winter, Clahane, 15th to 17th March; three, 18th March; two, 26th March; first winter, 16th April; first winter, 8th December. Quilty: first winter, Lough Donnell, 19th March; adult and first winter, 26th January; second winter, 22nd to 24th February; first winter, 26th March. Ballyvaughan: second winter, The Rine, 6th and 7th January; one, 3rd March. Kilkee: first winter, 13th April. Loop Head: one, Kilbaha, 28th January. Liscannor: adult, Clahane, 19th January; first winter, 17th and 18th March. Quilty: first winter, Lough Donnell, 13th January to 25th February; adult, 24th February; first winter and two second winter, 7th February; two first winter, 24th to 25th February; first winter, 1st to 8th March; three, 26th March; first winter, 16th April; first winter, 8th December. Common resident and passage migrant. Clarecastle: one, The Quay, 15th January. Loop Head: 1,700, Renville Bay, 5th October. Common summer visitor and passage migrant. Fanore: 100 off the beach, 21st August. Liscannor: 30, 24th May; 32, 15th June; 70, 21st June. One, Kilcredaun Marsh, 22nd September. A good record for Clare. Common summer and passage migrant. Bridges of Ross: 80, 15th September; 450, 16th September; 1000, 24th September. Quilty: one, Seafield, 30th August. These are the first records for several years. Common breeder and passage migrant. Newmarket-on-Fergus: one at Tradaree Point, 6th September was unusually far up the estuary. Scarce breeder and winter visitor. Ballyvaughan: 50, The Rine, 3rd March. Flaggy Shore: 11, Lough Murree, 29th November. Bridges of Ross: two, 15th August; adult summer, 19th August. Scarce summer visitor and passage migrant. Bridges of Ross: one, Bridges of Ross, 31st August. Hag’s Head: four, 14th March, 2007. Newmarket-on-Fergus: one, Ballycar, 2nd August. One, Loop Head, 1st October. with two at Loop Head during 2003 and one a Ballyvaughan in 2006. Turtle Dove John N Murphy. The first of the year was one hear calling at Loughaun North near Feakle on 15th April, followed closely by the second at Darragh, 17th April; one was seen on telephone wires near Cranny, 5th May. Reports were considerably fewer this than last due to Cuckoo survey of 2006. Poulnasherry Bay: one, Moyasta, 25th October. Sixmilebridge: one was seen near Minister’s Cross on 10th June and 24th November. Barn Owl John N Murphy. One was heard calling near Tubber on 23rd June. Rare winter visitor and passage migrant. The only report was of one at Tullagher Bog, Kilkee, 4th February. Doora: 80, River Fergus, 15th June. Ennis: one, 25th April; three, 26th April; four, Ballyallia Lake, 8th May; three, Knockanean, 9th May. Individuals were reported from Ballcorick Bridge and Clondegad at Ballynacally; Islandavanna near Clarecastle; Doonbeg; Drochidnagower Bridge and Abbey Street Car Park in Ennis; Kilcredaun Marsh at Loop Head; and Moyasta in Poulnasherry Bay. Two were at Ballynacorick Bridge on 21st September. Loop Head: 50, 4th October. The first of the year was seen in Shannon town on 9th March; there were eight at Ballyallia Lake, Ennis, on 12th March. Newmarket-on-Fergus on 3rd April. The highest count received was 300 on 15th June. The first of the year were a party of seven at Drumcliffe, Ennis 19th March. Clarecastle respectively on 17th April. Liscannor: one at Clahane, 31st October into 2008 (D. Mc Namara). Flaggy Shore: one, Lough Murree, 29th November (P. Troake). Clahane possesses a rocky shoreline which is well covered in parts with seaweed in winter and proved to be a huge attraction to pipits this year. This series of records brings the total for Clare to four. Liscannor: one, Clahane, 7th to 12th October (D. Mc Namara, J. N. Murphy). This transatlantic vagrant was part of an influx of this species into Britain and Ireland during 2007. It is the first record for Clare and about the fourth for Ireland. Bridges of Ross: one, 28th August. Doonbeg: one, 19th August; three, 3rd September; one, 25th September. Liscannor: one, Clahane, 14th March; one, 18th April; two, 28th April; one, 7th October; one, Cregg Beach, 16th September. Loop Head: one, Kilbaha, 31st August. Quilty: one, Seafield, 28th April; two, 30th August; two, 4th September; one, 21st September; one, Lough Donnell, 21st September. This is a good series of records for a species which is probably overlooked. Ennistymon; Claureen River, Kilmaley and the Owengarney River, Sixmilebridge. Kilkee: female, Kilkee, 5th February; one, 15th November. Liscannor: male, Clahane, 30th and 31st December. Loop Head: one, 24th October; one, 30th October. The first of the year, a female, was reported from Poulnabrone in the Burren, 24th March. Loop Head: two, 24th October; three, 30th October. The first of the year was one near Kilfenora on 20th April. Three were heard at Ballinruan on 29th April. One was heard in song at Doonagore Bog, Doolin, on 4th May. The first of the year was reported from the Roche plant at Clarecastle on 20th April. Doonbeg: three, 8th August; one, 9th August; two, 17th August; one, 22nd August. These birds were undoubtedly moving down the west coast on migration from breeding grounds further north, perhaps on the upper reaches of the Shannon. Loop Head: one, Kilbaha, 10th to 14th October; one, 24th October. All previous records during this decade came from this locality in 2001 and 2003. The first report of the year was from Clahane, Liscannor on 29th April. Three were reported from South Commons, Kilnaboy, 12th May. With thirty as a high count from Cranny on 21st May, it was an excellent year for this species. Increasingly common winter visitor, regular breeder. Barefield: two males, 9th January. Ennis: male, Ballyallia Lake, 4th January; male, 6th February; male, Our Lady’s Hospital, 5th January; male, Oak Park, 22th January to 20th February; female, 28th December; male, 30th December; female, Ballymacaula, 30th January; male, Ballymacahill, 10th to 22nd December. Newmarket-on-Fergus: male, Ballycar, 11th December; female, 26th December. Sixmilebridge: male, Oakwood, 30th November; male, 19th December. Burren: two males, Mullaghmore, 30th April; three males, 12th May; two, 20th May. Corofin: male, Annalabba Bridge, 28th July. Cranny: one, 21st May to 13th June. Ennis: male, Ballyallia Lake, 17th April to 13th June; two males, 20th June; male, Doora, 26th April; male, Knockanean, 10th May; male, Drumcliffe, 20th June; male, Lees Road Wood, 16th April to 19th May; two, 20th May; three males, 22nd to 24th May; two male, 26th May; male, 27th May to 7th July. Lissycasey: male, Booleygleeragh Bog, 12th June. Miltown Malbay: male, Mount Callan, 7th June. Ruan: three males, Dromore Wood, 20th May; two males, 13th, 20th, 29th May; one male, 31st May; four, 5th June. Tulla: one, Mc Graths quarry, 3rd May. Loop Head: one, 1st October; two, 24th October. It was an excellent year again for this species with an obvious spread in the breeding population. The winter records refer to the German population, which are wintering in increasing numbers in Ireland. Loop Head: one, 1st October; two, 20th October. Common resident and autumn passage migrant. Winter: one at Liscannor, 5th to 21st June. Autumn: one Kilcredaun on 30th October. The first of the year was at Ballycar, Newmarket-on-Fergus on 5th April. Ruan: two, Dromore Woods, 13th May. Inch: two, Inch Bridge, 29th May. Loop Head: two, 1st October (T.Tarpey). Loop Head: three, 1st October. Barefield: one, Ballycarroll, 12th February. Corofin: one, Lough Inchiquin, 29th December. Doora: one, Kilbrechin, 23rd November. Ennis: recorded every month except August and October at Lees Road Wood which a high count of four on 2nd February; one, Gort Road, 17th June; one, Cahercalla Road, 22nd August; one, Rosslevan, 1st November. Newmarket-on-Fergus: one, 17th and 18th June; two, 22nd June; one, 4th November. Ruan: one, Dromore Wood 26th March; one, 13th May; one, 5th June. Cliffs of Moher: eight, Hag’s Head, 14th March; two, 6th August. Kilkee: 13, Illaunanearean, 13th April. Lahinch: two at the Golf Club, 27th May; three, 9th August. Loop Head high count: 28, 23rd September. Quilty: two, Lough Donnell, 6th and 19th August. 20th to 22nd November and again on the 18th December (J.N. Murphy). One at Liscannor on 4th January was seen at Lahinch Marsh on 5th January. One was seen at Ballycar, Newmarket-on-Fergus on 14th April. Burren: one, Mullaghmore, 13th April. Cliffs of Moher: one, Hag’s Head, 14th March. Corofin: two, Lough Inchiquin, 19th November. Doolin: one, Doonagore Bog, 17th October. Doonbeg: three, 3rd August; one, 3rd September. Ennis: a pair were seen regularly around Ennis, particularly around the Friary church, from 12th March to 15th May; one, Ballyallia, 22nd March; one, 15th May; one, Lees Road Wood, 7th March; one, 7th June. Kilkee: two, Illaunanearean, 13th April. Loop Head: two, Kilbaha, 19th April; two, Cloughaun Lough, 10th August; two, 4th October. Miltown Malbay: one, Slieve Elva, 4th November. Newmarket-on-Fergus: one, Mooghaun, 3rd September; two, Ballycar, 22nd December. Poulnasherry Bay: two, 24th March. Quilty: three, Lough Donnell, 6th August. Ruan: one, Dromore Woods, 29th May. One was seen feeding with Starlings on the Limerick Road, Ennis in housing estates near the Halfway House pub, 19th to 25th August (F. MacGabhann, S Nugent et al). This bird was first found by a group of Swedish birders who had stopped at a filling station across the road from the pub. This is the seventh record for Clare and the first since 2002, which also occurred in Ennis. According to Ussher and Warren, the first county record came from Roxton, Corofin, “about 1808”. This is the oldest record cited by the authors’ and thus can be claimed as the first Irish record of this species. Doonbeg: 12, 23rd March; one, 5th August; two, White Strand, 11th November. Liscannor: one, Kilmacrehy Church, 16th May; two, 17th May; four, 20th May; five, 22nd May; two, 28th May; four, 1st June; eight, 15th June; two on a second brood, 29th June; five, 6th July; one, 28th July. Loop Head: three, 7th October; one, 10th October; one, 3rd November. Quilty: one, Seafield, 17th May; two, Lough Donnell, 2nd June. In the 2006 report, a call for increased submission of Tree Sparrow observations went out to local birders resulting in these series of reports. Results reveal that at Loop Head (particularly around Kilbaha) numbers have dropped off considerably in recent years, and while the numbers from Liscannor and Quilty are similar to previous record levels the 12 birds at Doonbeg is a higher count than was expected. All records come from coastal locations. Ennis: 150, Lees Road Wood, 2nd December; 100, 30th December. Loop Head: 100, 30th December. Kilkishen: one, Fenloe Lake, 1st January. Scarce resident and winter visitor. Four near Kilcredaun Lighthouse, 29th to 30th October (J N Murphy, F MacGabhann). This is the first county record and the fifth for Ireland. Arctic Redpoll at Kilcredaun John N Murphy. Newmarket-on-Fergus: 100, Fenloe Lake, 1st January. Feakle: a pair, Meaghera, 4th July. Loop Head: twenty, 14th October. Sixmilebridge: ten, Kilnacreagh Wood, 14th April. Doonbeg: one, White’s Strand, 16th December. Lahinch: one, 7th October; one, 14th October. An irregular winter visitor these days, the Lahinch/Liscannor records probably refer to the same bird. Kilmaley: eight Letteragh Wood, 25th March. Lissycasey: one, Booleynagleeragh Bog, 22nd December. Sixmilebridge: four, Kilnacreagh Wood, 14th April; two females and a male, 15th April. One near Kilcredaun lighthouse, 29th to 31st October (J N Murphy, J Rattigan et al). Initially this bird was seen but not identified on 29th October as it rose from a track into brambles. It was positively identified the next day at the same location where is presented itself briefly on an exposed section of the brambles. This is the seventh county record. The first was at Loop Head on 6th October, 1987. Loop Head: six, 23rd September; two, 29th September. Regular passage migrant and scarce winter visitor. Ballyvaughan: four, The Rine, 6th January to 6th February; one, 30th September. Doolin: six, Doonagore Bog, 22nd December. Kilkee: six, George’s Head, 14th January; ten, 19th January; ten, 21st December. Loop Head: one, 14th October. Barefield: a peak of ten frequented gardens in Ballycarroll where they fed on food provided for them from 8th January to 26th March; two had returned by 30th November. Burren: three, Poulnabrone, 24th March; two, Mullaghmore, 27th March; ten, 12th April; eight, 13th April; six, 28th April; two, 30th April; two, 12th May; eight, 20th May; one, Corcomroe, 3rd April; one, 10th April; one, Commons South, Kilnaboy, 20th May; two, Caherconnell Stone Fort, 30th May; male, Carron, 14th and 15th July. It seems clear from these records that the Burren is the stronghold for this species in Clare and this is borne out distribution map in the Clare Biological Records Centre database. Yellowhammer is an unusual garden visitor and the wintering flock at Barefield have exploited food left out for Chaffinches. The origin of this flock is unclear. Paul Archer, Lorraine Benson, Richard Bonser, Hugh Delaney, Simon Berrow, Dermot Breen, Pat Brennan, Gerry Butler, Ed Carty, Andy Clifton, Austin Cooney, John Coveney, Patsy Cronin, Tom Cuffe, Jamie Darrant, Mike Davis, Jim Dowdall, Brian Egan, Brian Finnegan, Donal Foley, Tom Foley, Mick Frosdick, Sineád Garvey, Phil Grosse, Dermot Harney, Brian Haslam , Barry Howell, Marc Hughes, Geoff Hunt, Harry Hussey, Mary Kearns, Aidan Kelly, Noel Keogh, Sean McEnery, Finbarr MacGabhann, Eamonn MacLochlainn, Stephen McAvoy, Phil Mc Inerney, Dave McNamara, Brian Lynch, Tom Lynch, Nuala Lynch, Tony Mee, Andrew Meehan, Christy Meehan, Maeve Meehan, Paul Moore, Nelson Morrison, John N Murphy, Pat Murphy, Killian Mullarney, Kevin Nunan, Stan Nugent, Barry O’Donoghue, Aonghus O’Donnell, Sharon Parr, Geoff Pearson, John Rattigan, Andre Robinson, Sean Ronayne, Tom Tarpey, Bill Ryan, Andy Smith, Danny Smith, Ger Walsh, Stephen Ward, Paul Troake, Mick Woreland, Andy Woods, John Wright, Iza Zawadzka. 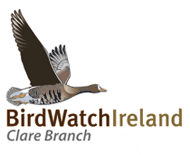 Thanks to Olivia Crowe of BirdWatch Ireland for her help in sourcing records, and to Mark Grantham and Iain Downie of the BTO for compiling the BirdTrack records for the county. Ussher, R. & Warren, R. (1900), The Birds of Ireland. Gurney and Jackson, London.